The other day I realized (over a year late) I had an iconic Kodak product: you don't even need to be a film collector to have memories of the Pageant. It's a classic. This topic is one of my favorites among the oldies. 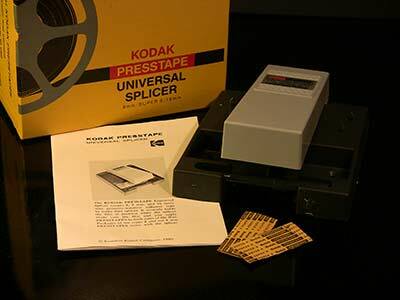 Kodak Presstapes and Splicers have edited miles of film. This is somewhat of a repeat of my posting on 5 August 2014. I had always admired the 16mm Kodak Pageant, often on American eBay, but, of course, living in the UK they would have not been suitable because of their voltage and frequency. I had wondered if they had ever been available in Europe. But in August 2014 there was one on German eBay, it was 200-240 volts and 50Hz. So I bought it. It's from 1972 and is optical/magnetic/record and is model AV-12ML-L. It has a transistorised amplifier and an auto 2/3 blade shutter (dependent on sound or silent speed). The lamp used is a mains voltage pre-focus base and was supplied with the A1/9 750 watt, but it can also take the A1/59 1000 watt lamp. After a some lubrication and minor repairs by my engineer it's running well and it is a great projector which I love. 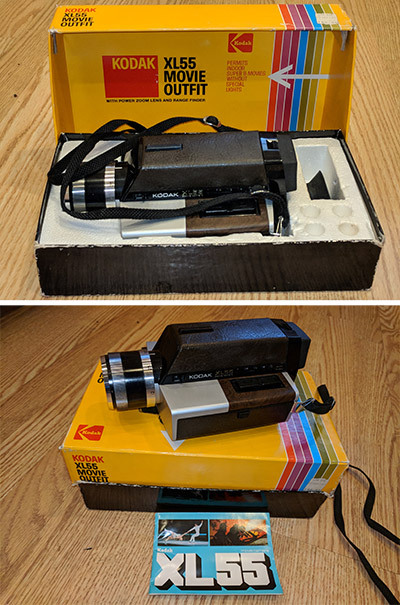 This Kodak Camera came bundled with a projector I bought a few years back. I know nothing about it or even if it still works. 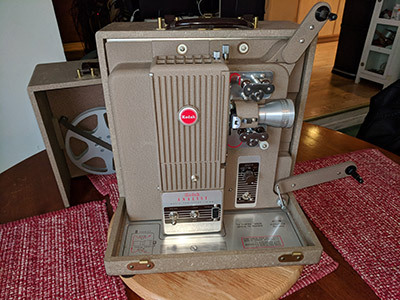 The Kodak Pageant is a great classic 16mm sound projector. However for it's slow motion capability the silent Analyst got a lot of use especially in sports. It will only take up to a 400ft reel..but it does have a convenient viewing screen built into the front cover. The Pageant is a reminder that Kodak used to make some really excellent cine equipment - before the advent of all their plastic super 8 junk of the 1970's. Yes, and this thing is downright industrial: everything except parts like the rollers tend to be metal. Plus there is perspective happening here: I've been doing Super-8 39 years now. -it's kind of the standard I live by. Now I've shifted gears at least part time to 16mm and it feels BIG! -something like what it must feel like to park a car and sit behind the wheel of a truck! In a way, the correct way to operate a Pageant is on top of a big, steel projector cart: this is their natural habitat and I never saw anybody use the handle on one until I was in my 50s. It was their normal migration pattern to be seen rolling down the hallway at school with a teacher close behind: -a stream of teenagers washing around them both. Very cool Graham I love that song.